Some people will believe anything, and there’s no shortage of people in the world willing to make a quick buck from the gullible. What follows is a collection of people who believed in all sorts of mythical creatures– and in some cases, the evil bastards who exploited those people for money. A man in Guadalajara, Mexico was picking guavas from a tree when he saw a glimmer amongst the leaves. He reached out and grabbed the object that caught his attention and realized that it was a fairy. Like any rational person, he stored it in a jar of formaldehyde–as you do–and put it on display for the whole town to see. More than 3,000 people waited in line for hours and paid the equivalent of $1.60 to get a look at the fairy. Several local skeptics (and there are quite a few of them) have pointed out that it looks very similar to a popular toy. 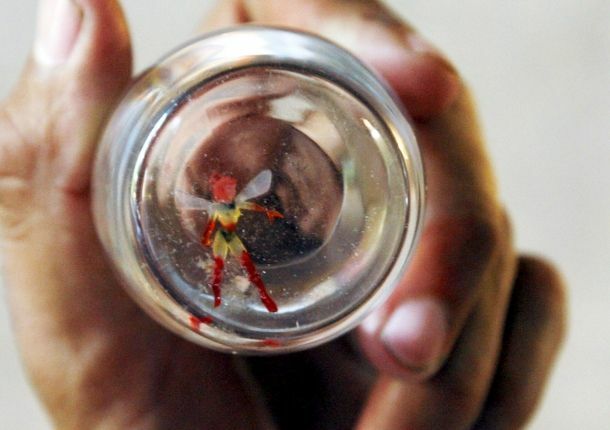 I don’t want to insinuate that this down-on-his-luck, unemployed bricklayer stuck a toy in a jar of formaldehyde and charged people to see it just to make a quick buck, but his “fairy” more closely resembles an action figure than anything that has ever been alive. 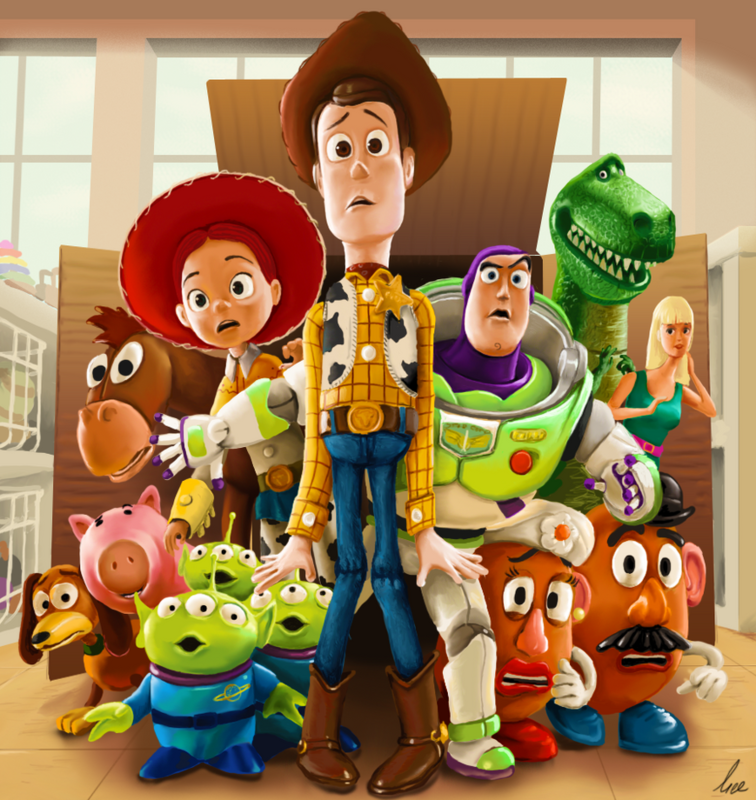 Unless you’re counting Toy Story. And let’s be honest. Who isn’t? Again, more than 3,000 people wanted so desperately to believe this story that they paid him $1.60 to get a look. And the guy was unemployed. Let's put the pieces of the puzzle together here, people. There really isn't a lot to go on here. 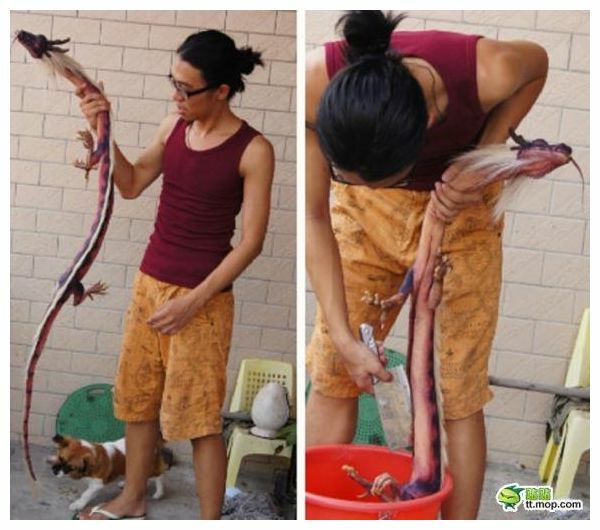 A picture has surfaced from China of a man who appears to be gutting his dragon while his dog plays with its tail. It’s also not known if the man is planning on eating the dragon, or if the dog knows that he’s the second course of the meal. There are really only two possibilities here. The image is either photoshopped or he's holding a dragon toy. The dog is playing with the thing’s tail, so it probably wasn’t completely photoshopped in. The most likely explanation is that the man is really holding a snake. Seriously, mentally subtract all of the dragon parts from the image, and what you’re left with is a snake. It’s possible that someone photoshopped in the dragon bits or that the man attached them to the snake himself and then painted it, or someone altered its color using Photoshop. Hell, you could do that with a handful of colored Sharpies. This one is kind of sad though because, real or not, it’s hard to stop picturing a dead Mushu from Mulan after seeing that. Alaskan police arrived at the scene of a beating one evening to find a man writing on the ground in pain and screaming. A few people were running away from the scene. When asked what happened, the man told police that a group of leprechauns had beat him up because they were mad at him for dancing with a girl. He was taken to the hospital and treated for the cuts and bruises all over his body (whether the wounds were inflicted by a shillelagh remains to be seen). The police never did find the leprechauns or their pot of gold, for that matter. They’re probably off terrorizing other townsfolk as we speak. He got beaten to the point of hallucinating little green men. An eyewitness said that a group of people, normal, regular-sized people, beat him up and ran off. The man, who had been beaten within an inch of his life, was probably dazed from the flurry of punches to his head. He was also likely very, very drunk. As for the girl that he was dancing with, perhaps he tried to dance with another man’s girlfriend, prompting a beating from the boyfriend and his friends. (Note: His friends were short, green, and fond of dancing jigs). And what makes more sense: a roving band of violent leprechauns, or some drunk guy getting too handsy with someone else’s girl? Plus, it was nighttime. There can’t be any rainbows at night, and everyone knows that you can’t find leprechauns without rainbows. Sheesh. 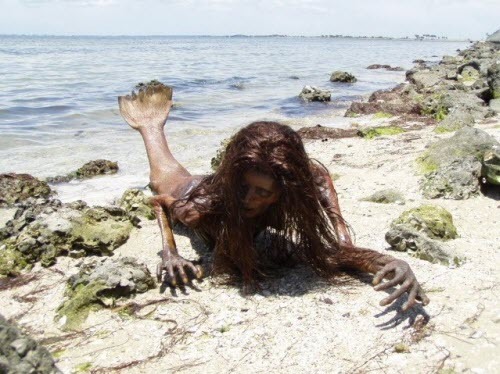 The camera man is silent, and just sweeps along the beach until he comes across the mermaid corpse. And despite her looking a bit like Skeletor and her mannequin-like appearance, it’s pretty convincing. I mean she’s dead–right? Rigor mortis, man. Let’s just ignore that anything that died in that position would have fallen face first into the sand instead of freezing in place. It’s totally real...sort of. Everything you see there is an actual dead thing of some kind. It’s just not a mermaid. It’s just one of the many macabre sculptures made by Juan Cabana. Sculptures that he makes using real dead fish, human skeletons, etc. He’s like a modern day Dr. Frankenstein but without the lightning, angry mobs, or windmills. And that image of a mermaid up there? You’ll find that very same image on his site under the “for sale” section. That particular sculpture, called “Nerina” actually sold for $10,000.